Hans-Peter Schmidt is a pioneer in using biochar in vineyards. He first established a biochar trial at experimental vineyard Domaine de Mythopia in Switzerland in 2007. His group’s ability to produce biochar has since grown, and this year they provided biochar for about 10 agricultural field trials in Germany, Norway, France, Switzerland, and Austria. Next spring, new trials will be established in at least 8 vineyards in Spain, Italy, France and Germany. Mr Schmidt directs the Delinat Institute for Ecology and Climate Farming that conducts studies on climate-positive farming with high biodiversity and biochar is one of its main research subjects. The research foundation’s laboratory is located on Domaine de Mythopia, and is developing practical methods and strategies for growing quality wines in ecologically and economically sustainable ways. The Delinat-Insitute does consultancy and produces the guidelines for around 80 organic winegrowers throughout Europe. It currently publishes the Ithaka Journal for Terroir, Biodiversity and Climate-Farming, where research findings are published. The Journal has also published Guidelines for the Production and Use of Biochar in Organic Farming. The first trials carried out in 2007 involved a replicated layout using biochar obtained from a provider in Germany. The experimental plot was 3000 m2 in size, with 1000 m2 receiving biochar. Biochar was mixed with compost, applied to the treatment plots, and incorporated by disking in the inter-row spaces between rows of vines. In these inter-row spaces, a variety of green manure crops including many legume species were seeded. The biochar-compost mixture was left on the soil’s surface along the rows of vines. The other treatments included plots treated similarly but with only compost added as an amendment, plots where only the legume mixture was seeded and finally control plots where no amendments or seeds were added. Soon after the beginning of the experiment, visible differences were obvious where vine growth was greater where biochar had been applied, and the nitrogen content in vines leaves was also measurably greater. Interestingly, the levels of amino acids in grapes in the first year of the experiment were much higher when biochar had been applied compared to the control, but also higher than in the plots receiving compost but not biochar. Amino acid levels in grapes are important in the juice fermentation process, and also contribute to disease resistance in the plants. Similarly, the amount of polyphenolic compounds in grape juice was 5% greater when biochar, compost, and legumes seeds were applied, compared to the unamended control, and approximately 3% greater than when only compost and legumes seeds were applied. Polyphenols have antioxidant properties which are associated to health benefits, and they also contribute to the taste of the finished wine. These results were very exciting to Mr Schmidt, who decided to expand his biochar research program. Since then, on-farm as well as pot trials with biochar have multiplied. These trials are aimed at developing best practices for biochar use, the production of biochar, biochar activation, and the safety of biochar in the soil environment. The Swiss Biochar Research Network has been formed, with 14 institutions including the University of Zurich, the Organic Agriculture Research Institute, the Institute of Life Sciences in Basel, the University of Fribourg, and the Institute of Life Science and Facility Management in Zürich. This year, Mr Schmidt also invited 500 Swiss gardeners to participate in a biochar field trial. Gardeners were offered 10 kg of biochar, and were given instructions on how to carry out the trial, on two 10 m2 experimental plots. Data from the gardeners will be collected over at least 3 years, and will be analyzed statistically. Results for the first year are available here. 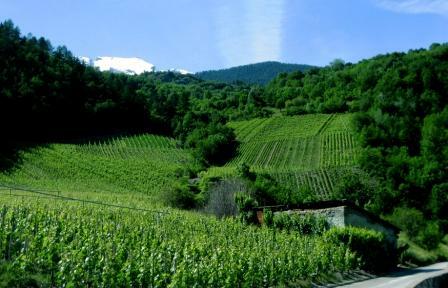 Domaine de Mythopia Vineyards; photo courtesy of Hans-Peter Schmidt. Biochar under green manure between rows; photo courtesy of Hans-Peter Schmidt. Pyreg Pyrolyzer at Swiss Biochar; photo courtesy of Hans-Peter Schmidt. 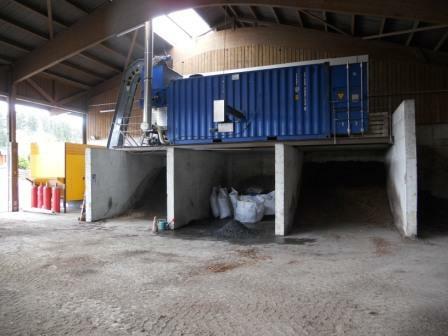 In order to produce biochar for researchers of the Network to test, Delinat Institute collaborates with Swiss Biochar in Lausanne that runs a pyrolysis unit purchased from Pyreg, which makes 350 tonnes of biochar a year. To produce the biochar they use pomace (the residue left over after pressing the grapes to extract their juice), twig residues from grape harvest, and other locally available biomass, such as clean municipal green waste. 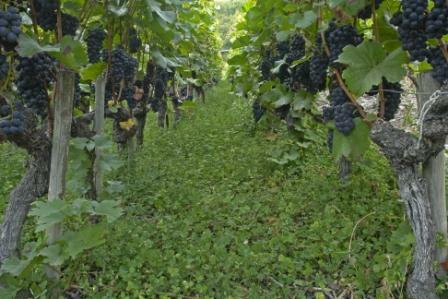 Vine prunings are not used to make biochar, since they are needed in the vineyard as a green manure. The biochar provided to researchers is of known quality and certified to be free from toxic substances. Tests are being carried out to “activate” the biochar through composting at Delinat’s composting facility. Mr Schmidt hopes that biochar will not become just another miraculous solution for mankind’s problems (as NPK once was), but the key to sustainable agriculture and a tool whose future role will not be limited to food production but will include ecosystem services, climate protection, biodiversity, sustainable landscaping, as well as the generation of energy and other products of pyrolysis. In his view, high ecological quality and biodiversity must reign on agricultural lands, meeting all the qualities expected of a highly species-rich nature reserve. Biochar could play an important role in this kind of utopic scenario, since it highlights the highly complex soil food web with every new field trial. It’s not a story only about biochar but about humus, soil life, and its symbioses.